New cart has front-folding external corner auger for unloading. New features for the 1210 Chief model include a drag auger that runs the full length of the cart and a front-folding, externally mounted corner auger for unloading. The dual auger design allows for a low center of gravity for the entire machine. The cart holds 1,250 bushels and the 22-inch unloading auger can dump it at a rate for 500 to 600 bushels per minute. An adjustable, perpendicular spout on the end of the auger allows for a true side to side adjustment and the corner mount enables the operator to watch the auger from the side window of the tractor cab rather than having to twist to look out the back window. New Orthman Mfg. 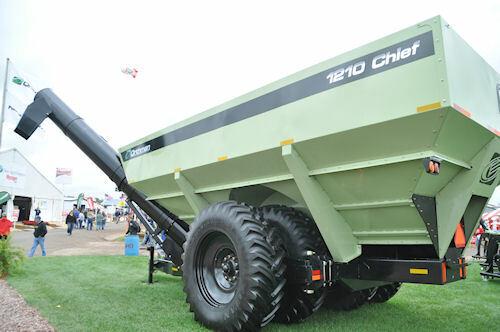 1210 Chief grain cart made its debut at Husker Harvest Days and will be available for sale in the fall o0f 2012.